Happy New Year to my fellow members of the extended family that is Judaism. 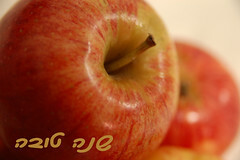 Rosh Hashanah, the Jewish New Year and high holiday, begins at sundown tonight. This is a time for families to come together, observe, and pray as a unit. Or, if you’re like me, you’re left to your own devices as far as observing the holiday and praying goes. A story came out today via the City Paper that Jewish residents living on Wisconsin Avenue NW (near Neapolitan pizzeria 2 Amys) encountered a hitch in their Rosh Hashanah festivities. Plans were set to celebrate the eventual ground breaking and opening of a modernized Giant grocery store and large residential development named Cathedral Commons for Thursday afternoon. According to the City Paper, people living in the area wished to attend but many couldn’t due to the Jewish New Year overlapping with the development launch. The launch party has been moved as to not conflict with Rosh Hashanah, leaving the once verklempt residents to observe the New Year uninterrupted by neighborhood events. Updated information for the launch party is not available at this time.